Tapplock one+ Bold. Sturdy. Secure. Three ways to unlock. Fingerprint unlocking, Bluetooth unlocking via the Tapplock app, and backup Morse-Code unlocking by pressing long / short combinations on the power button. Track access history using the Tapplock app. Sharing access is simple. Share Bluetooth access remotely with unlimited users. Set permanent access or limited access with flexible dates and times, and feel free to revoke access whenever you want. Track and monitor access history with time and location from the Tapplock app. One year battery life per charge (or 3,500 unlocks). 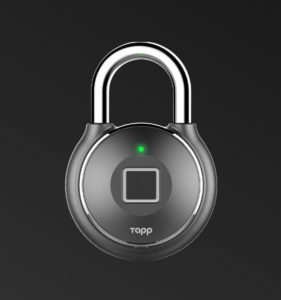 You can check remaining power using the Tapplock app. Using our app from the App Store or Play Store, your lock profiles will show the battery percentage remaining on the lock. Tapplock blinks red when power is below 10%. In case it does run out, a 8 second charge using any portable battery pack will awaken the Tapplock. Water and weather-proof. Industry leading IP67 water-proof rating allows Tapplock one+ to function even when completely submerged. Dust-proof and rust-proof. Functional between -20C to 65C (-4F to 149F).